Iceland is an amazing country full of natural wonders. Torn apart by the sheer forces of the Earth, it is formed by fire and ice and an extreme climate. It is a wild and dangerous country and we are deeply in love with it, but for one thing: Whaling. Iceland is one of the very few countries that still allow commercial whaling and sets catch quotas every year for minke and fin whales. Over centuries and especially during the industrial revolution, whales were hunted to an extend that were on the brink of extinction. There was a time when it was whale oil that lit the streets lamps and houses in many cities of the modern world. In 1986 finally, the IWC (International Whaling Commission) stated, that only “a total ban of hunting would protect whales and allow depleted populations to rebuild” and all commercial whaling worldwide was banned. Some countries (e.g. Japan, Norway and Iceland) didn’t abide by these rules and were quick to find loopholes in the moratorium continuing their hunt under the disguise of “scientific research”. Japan is still using to that loophole today. Norway and Iceland openly defy the IWC’s 1986 ban on hunting whales and simply resumed commercial whaling. “In 2006, well before publishing any research findings from its ‘special permit’ hunt, Iceland resumed commercial whaling.“ The issued quotas rose from year to year. 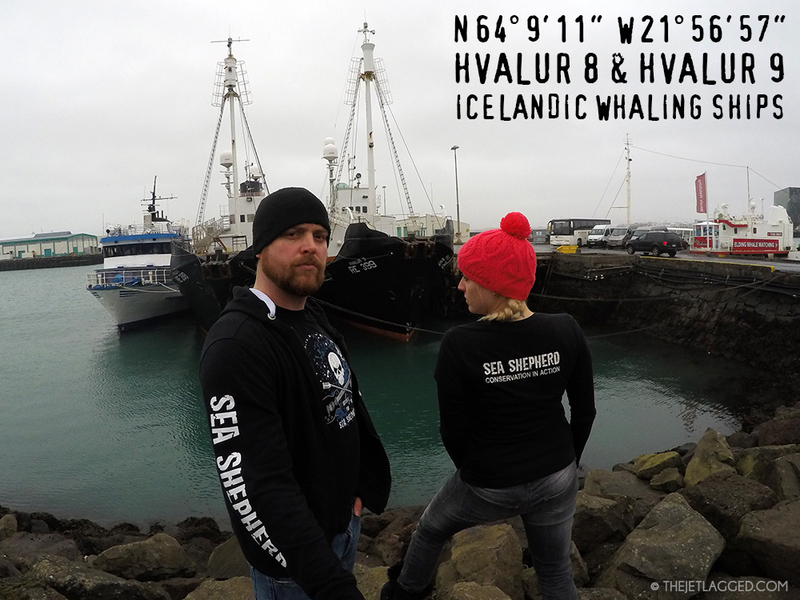 Since 2013/2014, Icelandic whalers are allowed to catch 154 fin whales and 229 minke whales per year. The Whales are being killed by firing explosive harpoons into their body. It can take up to 60 minutes until a whale dies from its injuries. Today, there is only one company, Hvalur H/F with its CEO Kristján Loftsson, that stands behind commercial whaling in Iceland, operating the vessels Hvalur 8 and 9. The blubber and meat from fin whales they catch is directly shipped to Japan and sold there. Iceland is selling out it’s amazing wildlife, it’s great whales, to a foreign country; for just one thing – profit. [Updated September 2015] In June 2015, Sea Shepherd ran a mission to investigate the shipment of endangered fin whale meat from Norway to Japan, crossing Russian waters. The Saint Kitts- and Nevis-registered cargo vessel, “Winter Bay” was in port in Norway and awaited permission then to make the crossing through the arctic despite being only ice class 1. It was carrying an illegal cargo of 1,700 tonnes (approximately 1,800 tons) of endangered fin whale meat from Iceland. Online petitions gathered millions of signatures urging the small Caribbean country to withdraw their ‘flag of convenience’ for the ship, but the calls were ignored. End of August 2015, the Winter Bay reached its destination in Osaka, Japan. Because the illegal cargo violates the Convention on International Trade in Endangered Species (CITES), the Icelandic shipment could not be sent via the Panama or Suez Canal and the ship could not stop in any European, North American, South American or African ports. Iceland’s domestic market for whale products is small. Polls indicate that most Icelanders never eat whale meat. Minke whale meat is offered in restaurants, giving tourists the opportunity to eat something “exotic”. 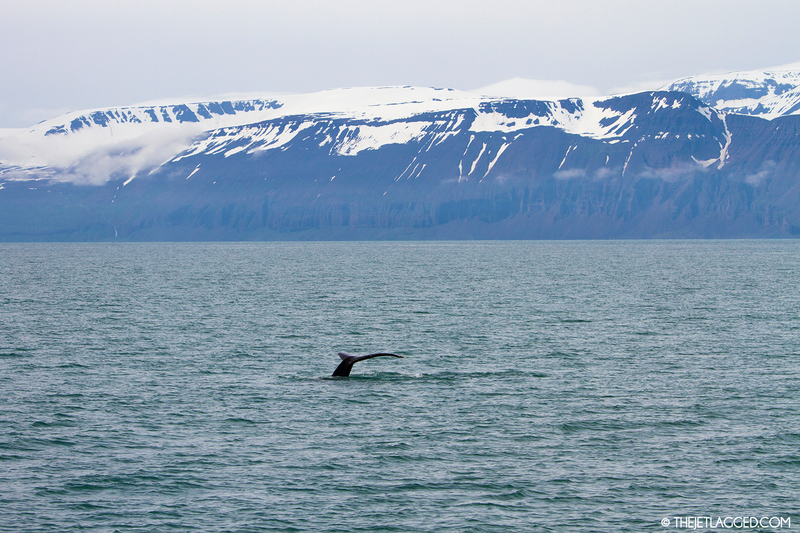 80% of minke whales are hunted and killed right next to the main whale watching area in Reykjavik. 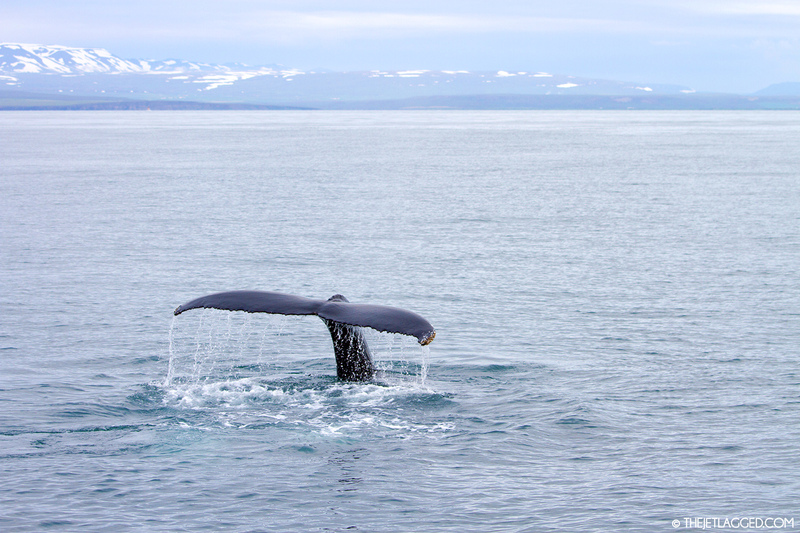 Ironically, whale watching is one of the major attractions for tourists in Iceland and passenger numbers have been rising steadily over the last 20 years. 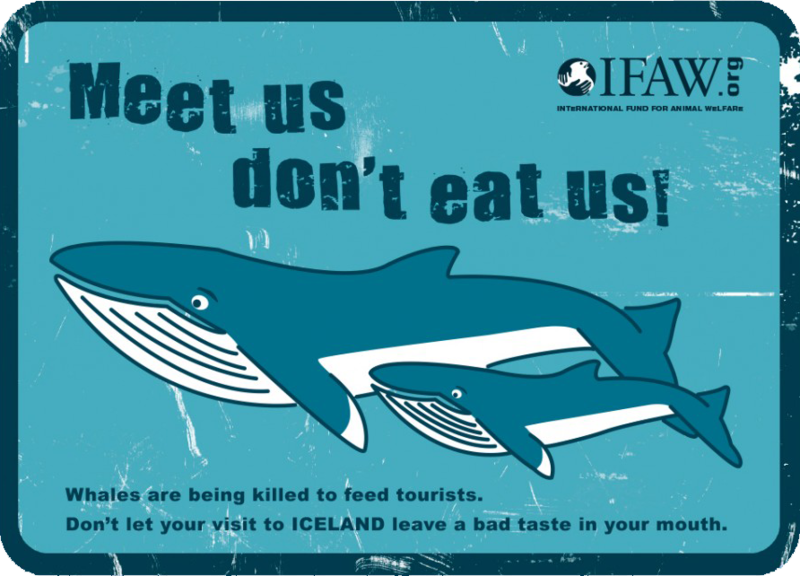 There are also local organizations opposed to whaling – they work together in programs to educate tourists not to eat whale while in Iceland (“Meet us, don’t eat us). We are convinced that the time of whaling is over. 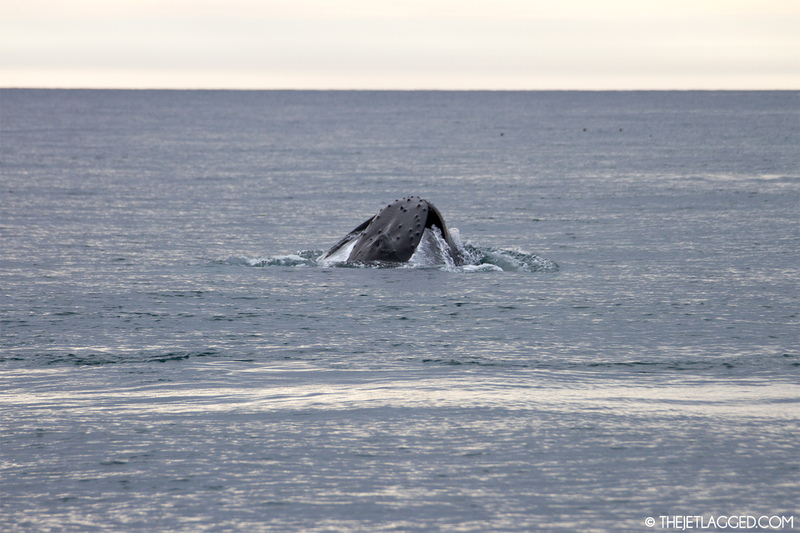 We were really lucky to see Icelandic whales, alive, on a great whale watching trip from Húsavík with Salka Whale Watching (all photos here were taken on this trip): Humpback whales, breaching and fin slapping, and we even saw a blue whale, the largest mammal on this planet! These were unforgettable moments full of respect for these creatures! Whales are some of the most amazing, social and intelligent animals on this planet, and they were already nearly brought to extinction once. 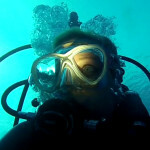 Today, they still face enough dangers through pollution, plastic debris, ghost nets and boat traffic. The pressure has to be kept high on nations that still commercially hunt whales, to finally give these creatures peace and preserve them for future generations. SLAYED IN ICELAND – The commercial hunting and international trade in endangered fin whales (report by Animal Welfare Institute, Environmental Investigation Agency and Whale and Dolphin Conservation) 2014. 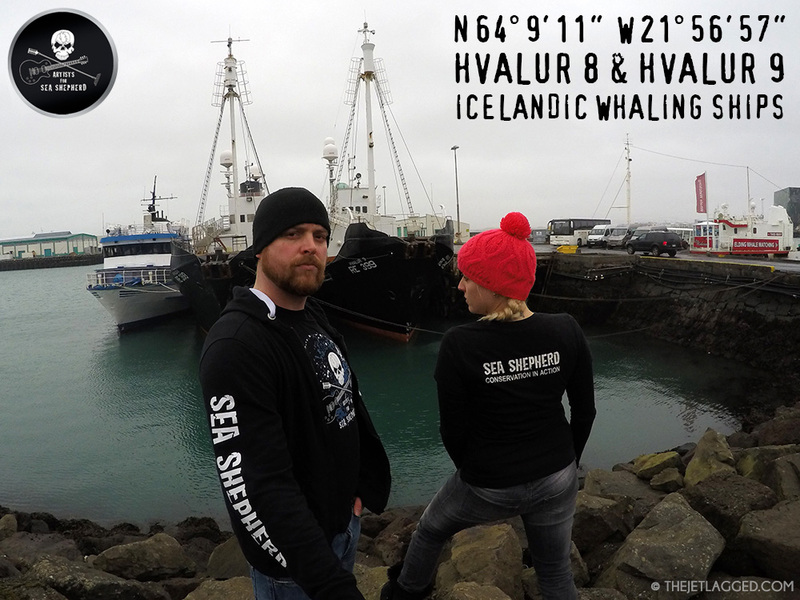 Icewhale’s aim is to inform and educate Icelanders and tourists about a few facts regarding whale meat consumption in Iceland and have their support to end commercial whaling instead of contributing to it by tasting it in restaurants.